Whoa! Apple has just opened up a new featured section in the App Store which is titled as “Try Before You Buy”. 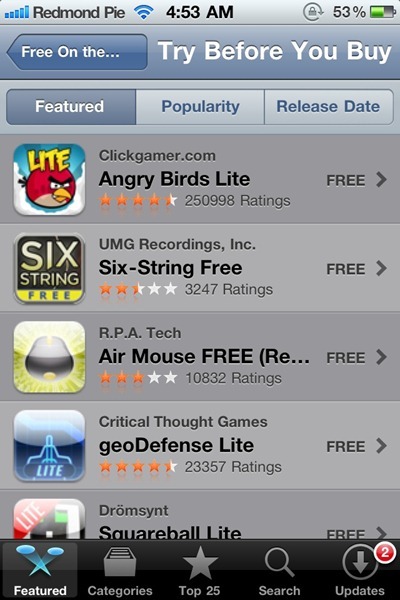 As the name suggests, this new section features all the lite and free version of popular apps in the App Store. If anything, Apple must have taken this initiative in a bid to fight against the ever growing number of pirated apps which are easily available on jailbroken iPhones, iPod touches and iPads. lol, try before you buy. hmm, what made them do that 🙂 oh wait, I already know the answer to that. How is this any different than just downloading a free or lite version of an app? nope, still usin' installous here! If I was a pirate, this wouldn't even faze me. Pirates hide behind the “trial version” cloak, but in reality, they just want to get full versions for free. Apple is full of it. Stayin jailbroken! No other way to go. Lite & Free versions still don't give you the full picture of what a game is all about, and many apps still don't have free versions, better to have a free install pay after seven days if you want to keep the app scheme. I believe personally its like sorting out all the existing free & lite versions of the paid Apps under a new genre “Try before you buy”. Its not like a new model where it allows you to try a full featured App for a period of time as a trial. In simple words, It reorganized the apps to make the free & lite apps more them more visible. erm… I dont think so. Sadly this is nothing new. This is just a section of the store where they put all the lite version apps. It's nothing new. this isn't really much of anything. these free/trial apps already are on there. now if they made it so apps that normally don't have trials could be used for 24-48 hours or so THAT would be something. this is just meh. I wouldn't, don't get fooled, this doesn't mean you getting the full versions anyway, stay jailbroken, stay cracked… !!! lol @ Apple… Haters. This won't stop me..I don't see how “try before you buy” is going to stop piracy.. Applications like Installous make it possible to get apps for free i.e – TomTom which is about 40 pounds. Adding this won't sway me to not stay jailbroken. They only have 98 apps in the section. How many paid apps are there again? Thousands? Oh, i have been doing this “try before you buy” for long time. Its called install0us.